SGX closed with a doji @ S$7.44 (+0.02, +0.3%) with 1.62m shares done on 5 Apr 2019. 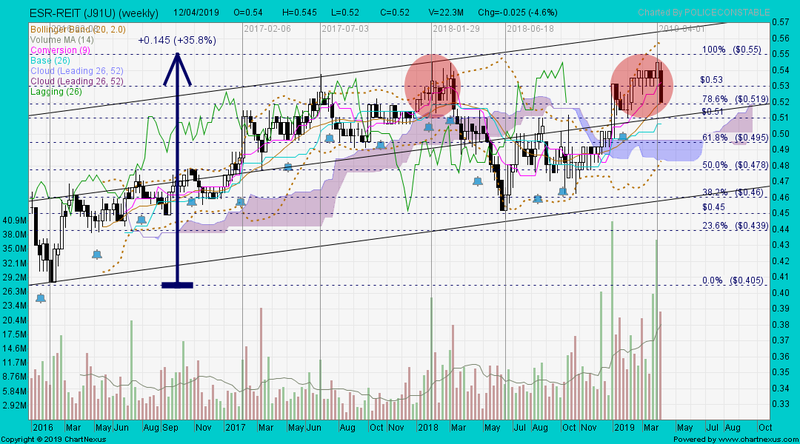 Immediate support @ S$7.35, immediate resistance @ S$7.52. SGX closed with a dark cloud cover @ S$7.31 (-0.02, -0.3%) with 2.04m shares done on 18 Mar 2019. 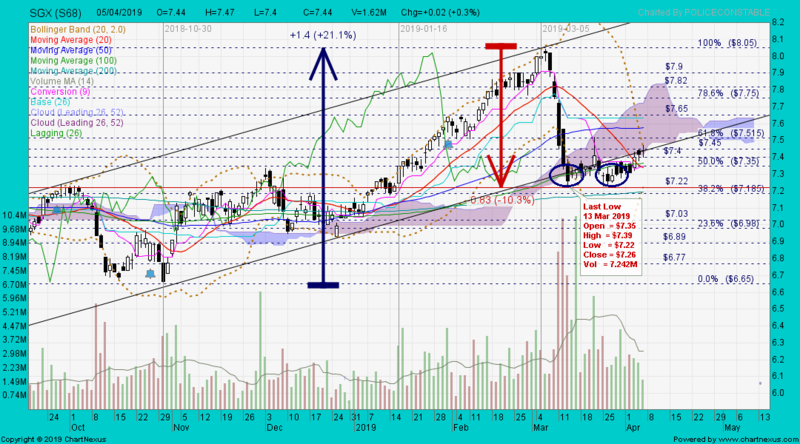 Immediate support @ S$7.22, immediate resistance @ S$7.40. CIMB closed with an inverted hammer @ RM5.11 (+0.01, +0.2%) with 2.33m shares done on 5 Apr 2019. 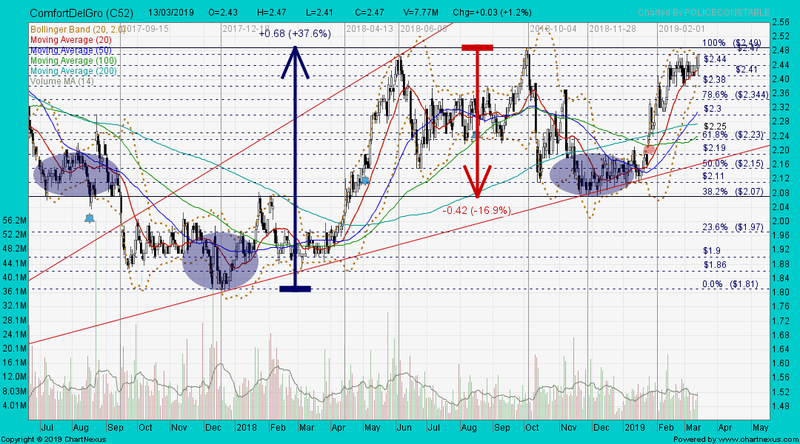 Critical support @ RM4.98, immediate resistance @ RM5.16. CIMB closed with a black marubozu @ RM5.68 (-0.17, -2.9%) with 19.5m shares done on 1 Mar 2019. 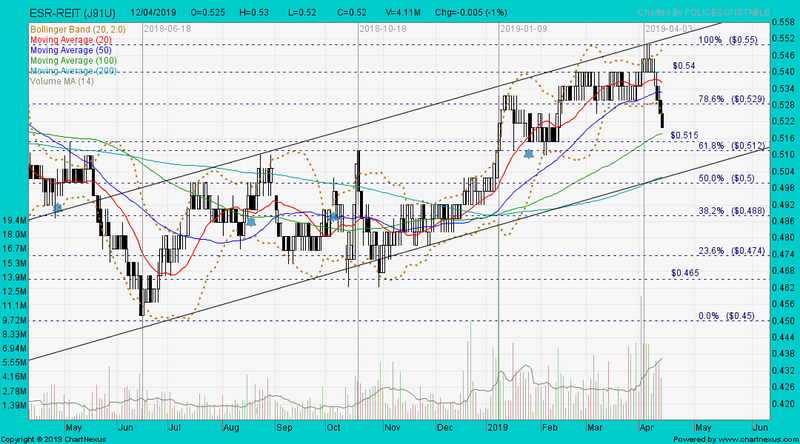 Immediate support @ RM5.60, immediate resistance @ RM5.91. Chartist always refers to both; 1) charts + 2) latest news. Golden Agri closed with a white marubozu @ S$0.32 (+0.005, +1.6%) with 17.0m shares done on 5 Apr 2019. 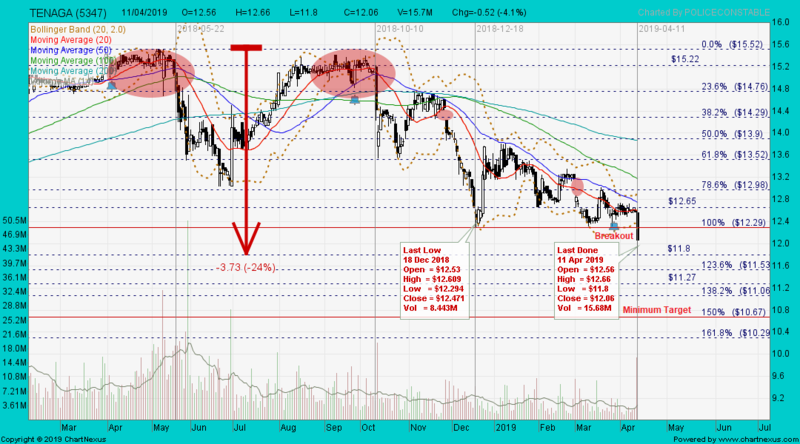 Immediate support @ S$0.30, Immediate resistance @ S$0.33. 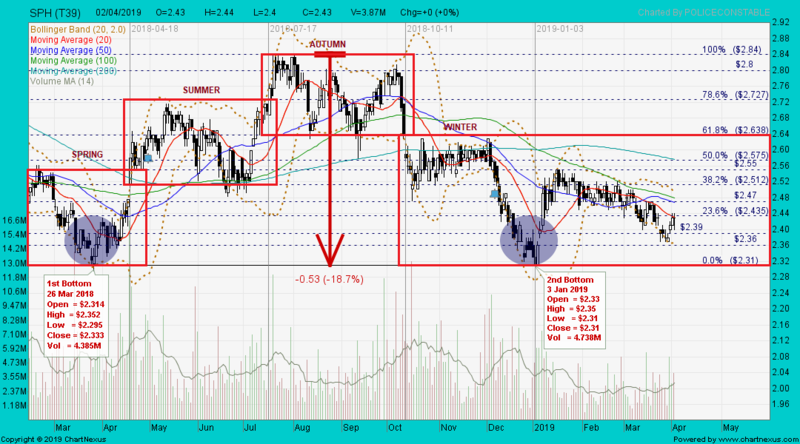 Golden Agri closed with a doji @ S$0.28 with 17.3m shares done on 26 Feb 2019. 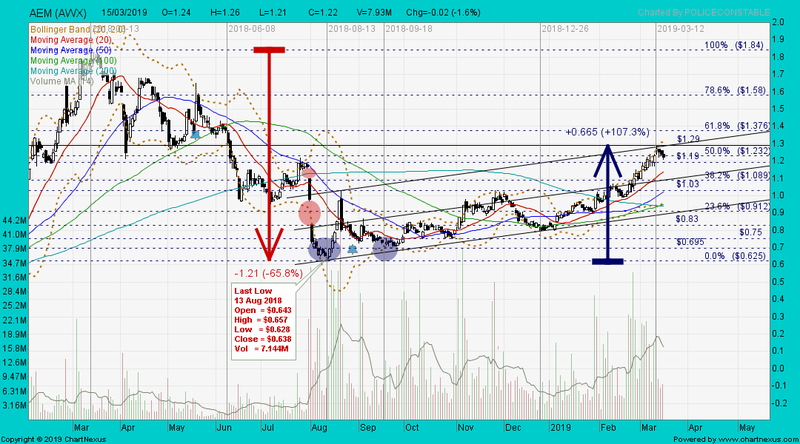 Immediate support @ S$0.265, Immediate resistance @ S$0.29. FCPO futures @ RM2,219 on 8 Apr 2019. The current re-negotiations on the East Coast Rail Link (ECRL) may see its construction price pegged at RM50mil to RM60mil per km as well as a commitment by the Chinese government to buy Malaysian palm oil and bring in projects, according to sources. FTSE4Good indices are under fire for inclusion of Golden-Agri Resources. ComfortDelgro closed with a bullish harami @ S$2.57 (+0.03, +1.2%) with 5.05m shares done on 8 Apr 2019. 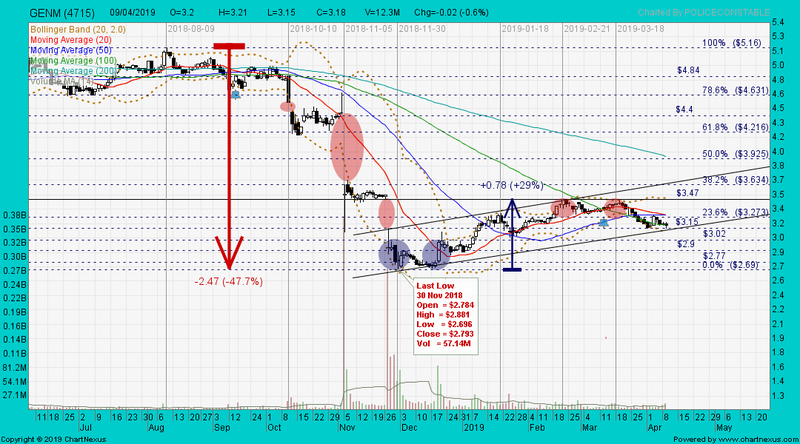 Immediate support @ S$2.49, immediate resistance @ S$2.58. ComfortDelgro closed with a hanging man @ S$2.47 (+0.03, +1.2%) with 7.77m shares done on 13 Mar 2019. 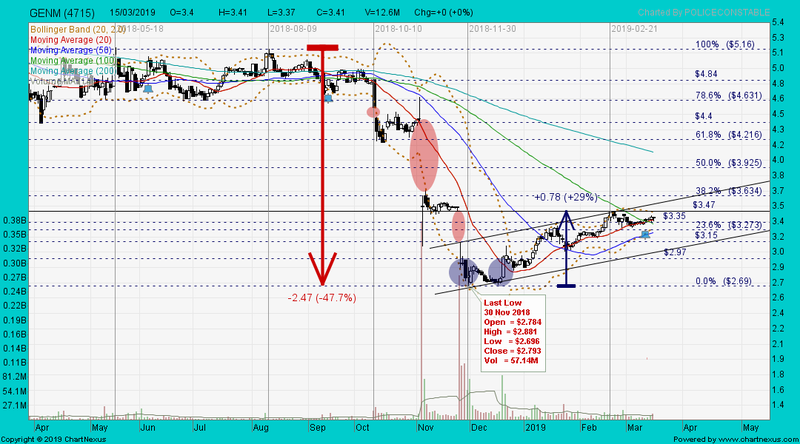 Immediate support @ S$2.38, strong resistance @ S$2.49. SM Investments (SMI), the vehicle for the Indonesian Salim Group led by billionaire Anthoni Salim has aborted its proposed deal to invest in Hyflux, ending an agreement that was seen as a lifeline for the beleaguered water treatment company. JAKARTA -- Indonesian food giant Indofood Sukses Makmur's 2.2 trillion rupiah ($164 million) purchase of land in Jakarta from its chief executive, billionaire tycoon Anthoni Salim, is raising fresh questions over corporate governance in a country where close-knit families wield strong influence over group companies. The deal, announced on June 8 by Hong Kong-listed First Pacific, Indofood's parent company, had sent Indofood's stock price 5% lower by June 13, as investors considered the additional financial burden. The stock rose 0.9% on Wednesday, and is still up 8% so far this year. The transaction involves Aston Inti Makmur, an Indofood subsidiary, buying six plots of land in Penjaringan, North Jakarta, with a total area of 42,877 sq. meters for 51 million rupiah per sq. meter. The sellers are Anthoni Salim and Adithya Suramitra, a local company that he owns. Indofood group subsidiary Salim Ivomas Pratama already uses the land to operate cooking oil facilities. First Pacific said Anthoni Salim had been leasing the property to Salim Ivomas -- some of it for free -- but that after he received an offer from "an independent third party," he gave Indofood a priority offer to buy it. Indofood "recognizes the importance of the availability of the purchased lands ... to continue its cooking oil production business and decided to accept the offer," First Pacific said. The deal, which surprised analysts, highlights the influence that controlling shareholders can have over the companies they own, and raises questions over the ability of such businesses to protect the interests of minority shareholders. First Pacific said Anthoni Salim abstained from voting on the acquisition. But Indofood's board of directors includes his son, Axton Salim, and Franciscus Welirang, who is married to Anthoni Salim's sister. "There have been major improvements in corporate governance in Indonesia," said Yuri Sato, executive vice president at the Japan External Trade Organization. "But when the owner and manager are the same, there are limits to checks and balances." Anthoni Salim is the second-generation chief executive of Salim Group, considered Indonesia's largest conglomerate, with interests spanning food, retail, automobiles and more. He is the largest shareholder in First Pacific. While some individual companies such as Indofood are publicly listed, the group's overall financials are nearly impossible to grasp due to complex holding structures. The acquisition price of 2.2 trillion rupiah is equal to 16.5% of Indofood's cash on hand as of March, according to its financial statement. 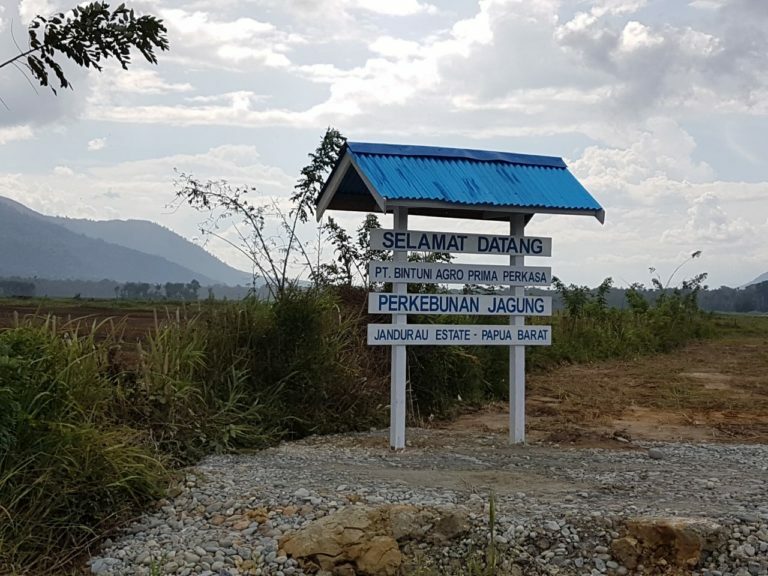 The "purchase price does not look cheap considering the location," local brokerage Mandiri Sekuritas said in a research note on June 9. First Pacific said the land's valuation was provided by "an independent valuer." Sato said it is unlikely that Anthoni Salim would conduct a deal that would jeopardize Indofood -- one of the world's largest producers of instant noodles -- because the company is Salim Group's crown jewel. She acknowledged that, "There are merits of a structure in which ownership and management are not separated." Indofood did not respond to requests for comment, and Anthoni Salim could not be reached for comment. AEM gapped down and closed with a black marubozu @ S$1.09 (-0.06, -5.2%) with 17.4m shares done on 9 Apr 2019. Immediate support @ S$0.99, immediate resistance @ S$1.15. 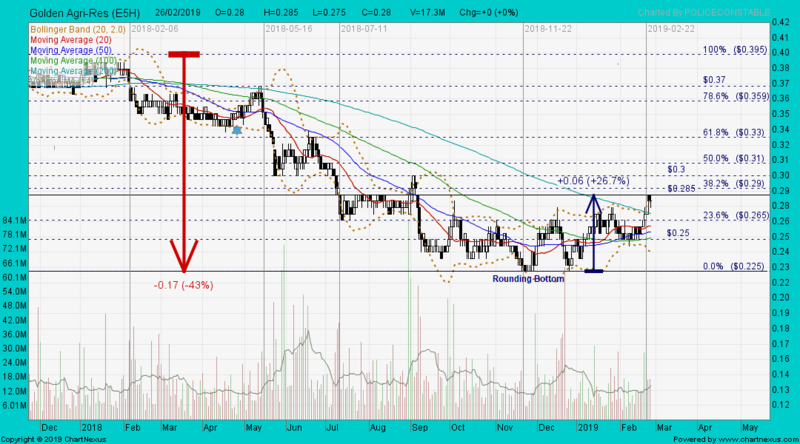 AEM closed with a "three black crows" candlestick pattern @ S$1.22 (-0.02, -1.6%) with 7.93m shares done on 15 Mar 2019. 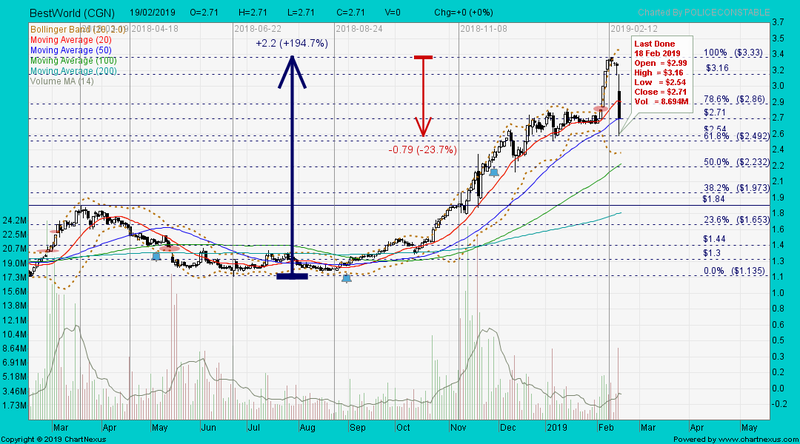 Immediate support @ S$1.19, immediate resistance @ S$1.29. 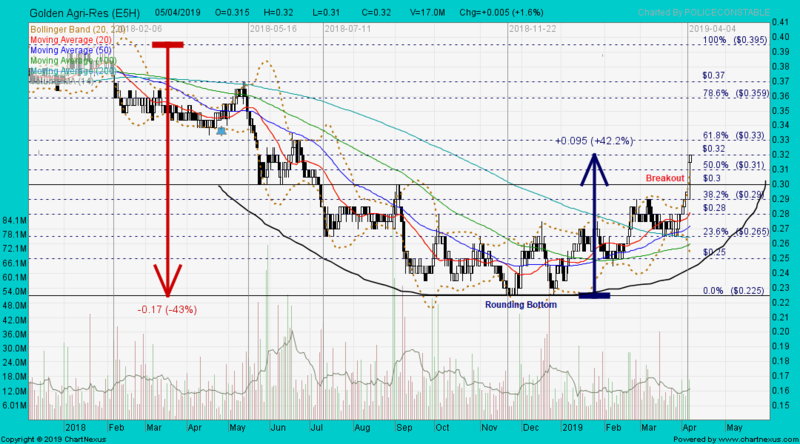 GENM closed with a spinning top @ RM3.18 (-0.02, -0.6%) with 12.3m shares done on 9 Apr 2019. Immediate support @ RM3.15, immediate resistance @ RM3.27. GENM closed with a hanging man unchanged @ RM3.41 with 12.6m shares done on 15 Mar 2019. Immediate support @ RM3.35, immediate resistance @ RM3.47. RHB Research Institute Sdn Bhd has maintained a "buy" call on its top pick Genting Bhd with sum-of-parts target price lowered to RM8.31 from RM8.79 previously, on the back of higher gaming tax rate and redevelopment of Resort World Sentosa (RWS) in Singapore. GENTING closed with a doji unchanged @ RM6.83 with 1.97m shares done on 9 Apr 2019. 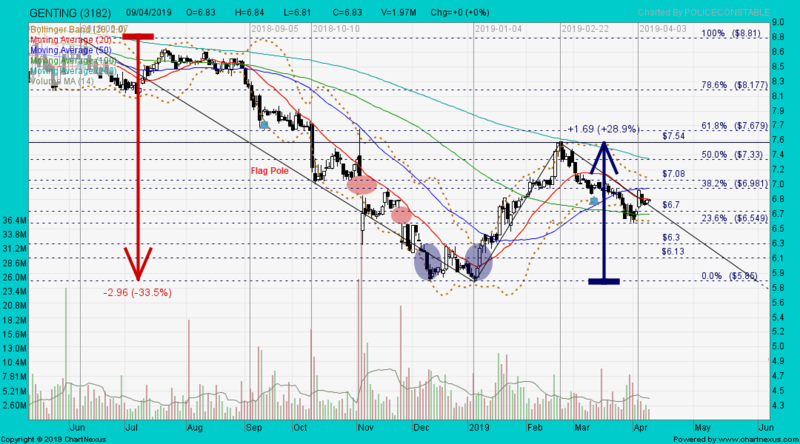 Immediate support @ RM6.70, immediate resistance @ RM6.98. GENTING closed with a hammer @ RM6.95 (-0.03, -0.4%) with 9.51m shares done on 15 Mar 2019. Immediate support @ RM6.80, immediate resistance @ RM7.08. The Monetary Authority of Singapore says that its supervisory reviews to date have not uncovered any impropriety on the part of DBS when performing its roles as both issue manager and distributor of Hyflux perpetual securities in 2016. An investor, who asked to be identified as Mr S.G. David, says: "Many of us want to sue Olivia Lum, the board of directors, the auditor and the banks. What we are asking is for the regulator to investigate and find out if there were any breaches committed. With this, we can get our recovery from the personal wealth of Olivia Lum, the board of directors, the issuer, auditor and the banks. We believe we have a case." In 2017, when Hyflux reported losses of $115.6 million, Ms Lum received between $750,000 and $1 million in salary, benefits and bonuses, SIAS said. “How was Hyflux able to justify such large remuneration given (its) financial position and the performance of (its) businesses and assets?” SIAS asked, questioning as well if there has been an independent investigation on the role of key executives in the firm’s collapse. As it turns out, the person who heads the Board’s Remuneration Committee in Hyflux is Gay Chee Cheong, who is also a member of the Nominating, Audit and Investment Committees. Gay Chee Cheong sits on the board of both Hyflux and Heliconia Capital Management, a wholly owned subsidiary of Temasek Holdings. The chart below compares the company’s reported net gearing and our adjusted net gearing, if we simply reclassified the perpetual securities as liabilities. 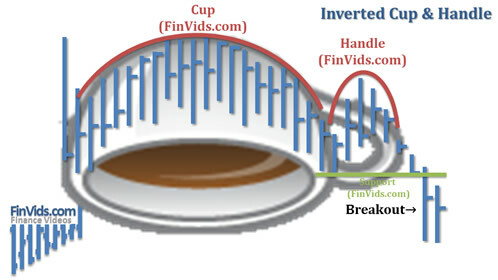 Should we also make adjustments for the higher reported profits under INT FRS 112 and capture the perpetual dividends as interests, it is certain profits would have been even lower — and net gearing even higher. 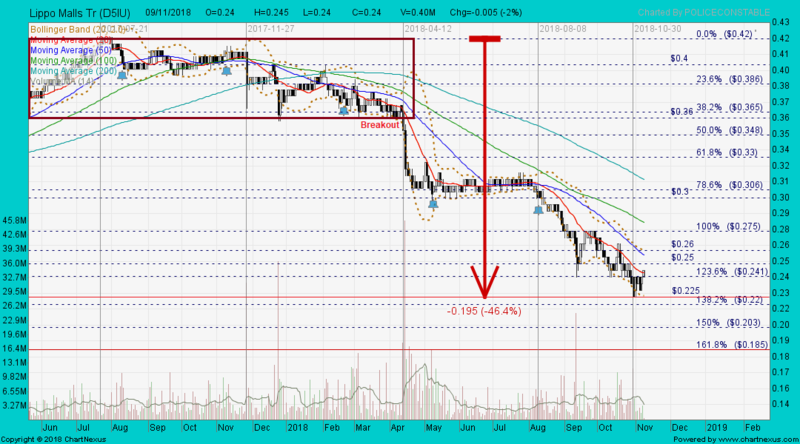 Best World closed with a harami cross @ S$2.00 (+0.02, +1%) with 3.39m shares done on 10 Apr 2019. 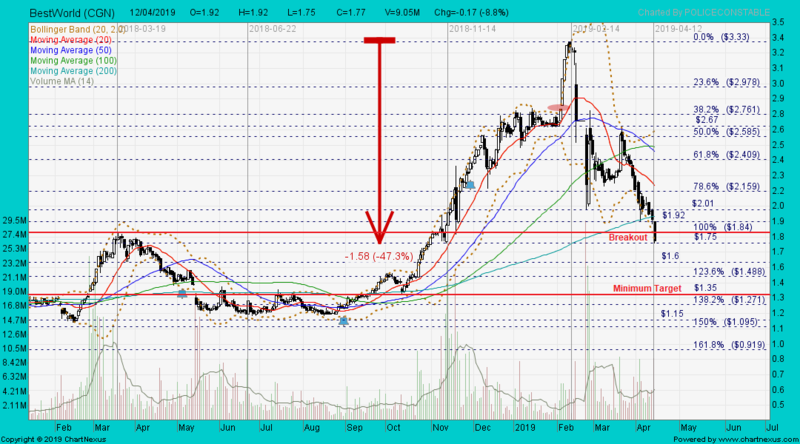 Critical support @ S$1.98, immediate resistance @ S$2.11. Best World closed with a spinning top @ S$2.71 with 8.69m shares done on Monday 18 Feb 2019, prior to trading halt. SPH closed with a black marubozu @ S$2.44 (-0.03, -1.2%) with 6.91m shares done on 11 Apr 2019. 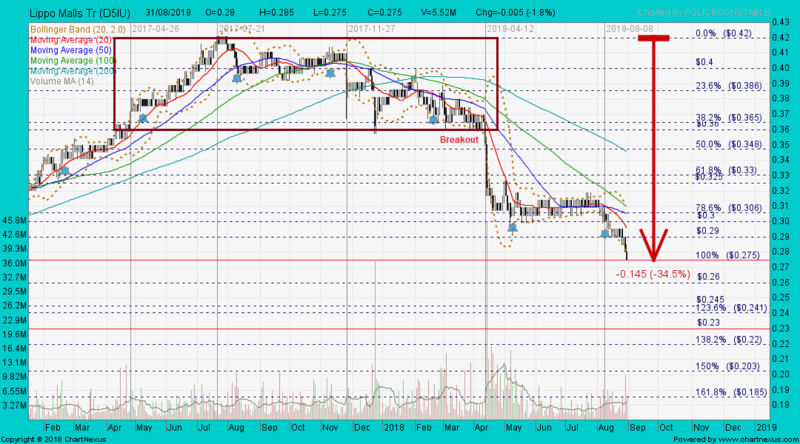 Immediate support @ S$2.39, immediate resistance @ S$2.51. 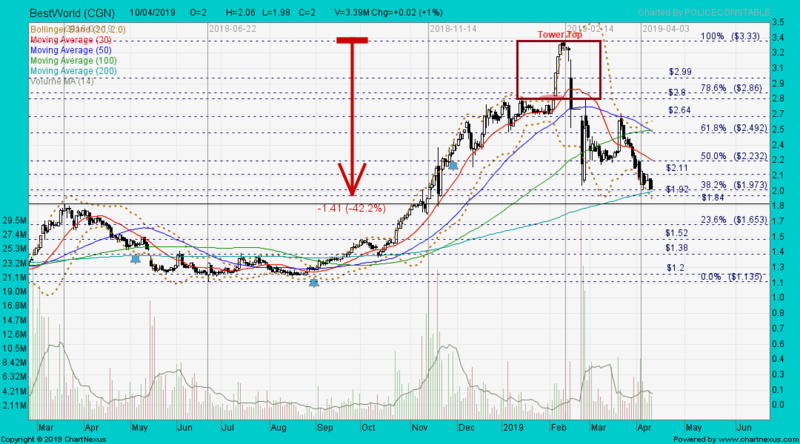 SPH closed with a long-legged doji unchanged S$2.43 with 3.87m shares done on 2 Apr 2019. 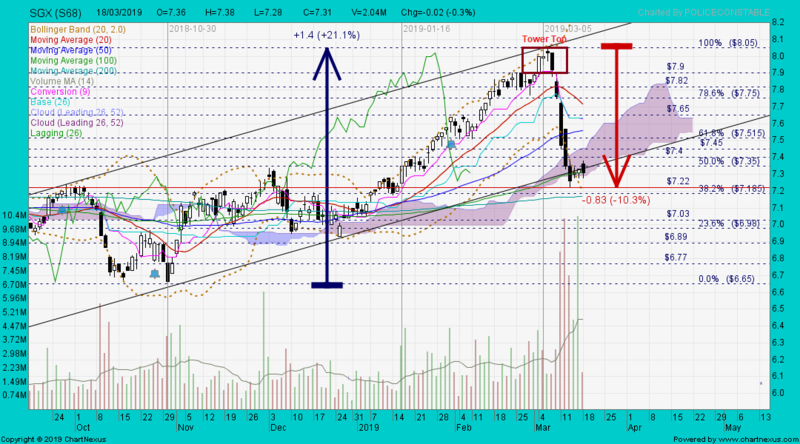 Immediate support @ S$2.39, immediate resistance @ S$2.47. FBMKLCI closed @ 1,624.23 (-15.23, -0.9%) on 11 Apr 2019. Immediate support @ 1,609, immediate resistance @ 1640. FBMKLCI closed @ 1,641.81 (-3.26, -0.2%) on 5 Apr 2019. 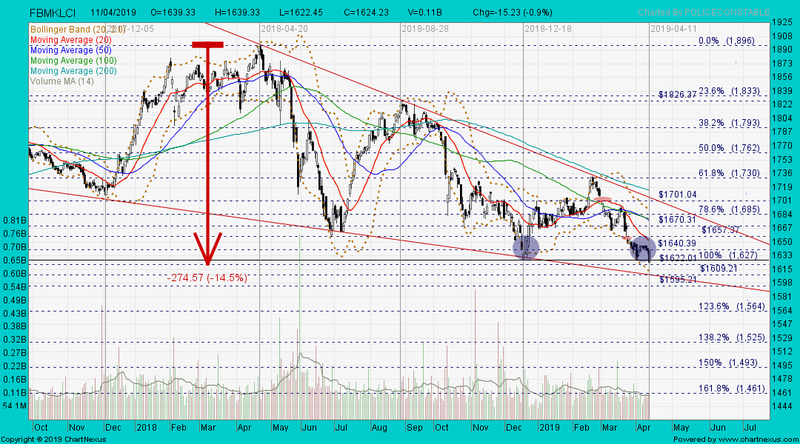 Immediate support @ 1,627, immediate resistance @ 1657. 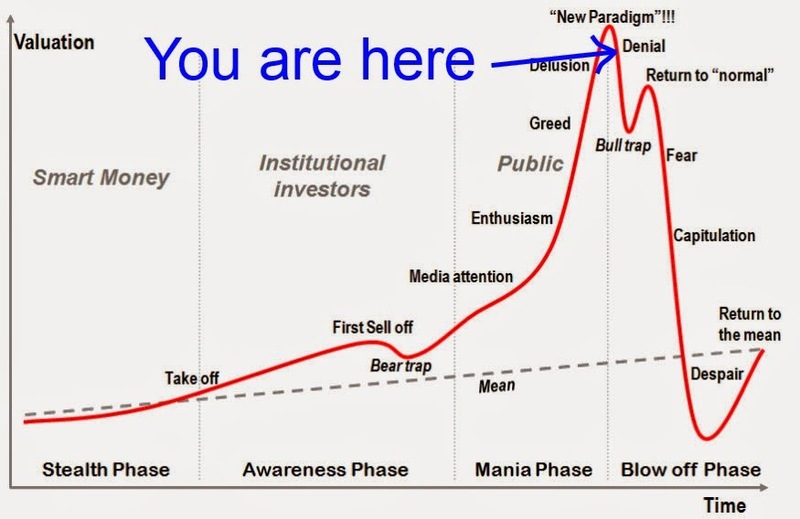 When a stock is in a bear-market territory, the last low will be retested and the share price will move much further down, forming a new record low. Before the placement, Khazanah Nasional was the largest shareholder in the power giant at 28.76% or 1.635 billion shares followed by the Employees Provident Fund with 14.05%. 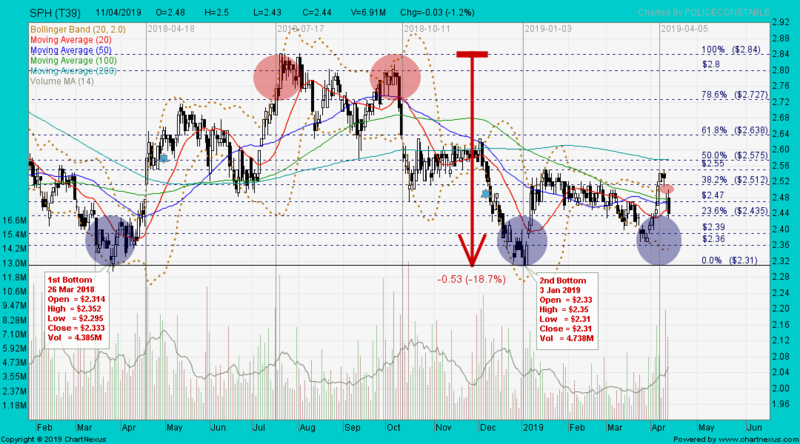 Skim Amanah Saham Bumiputera owns 9.10% and KWAP 5.45%. TENAGA closed with a hammer @ RM12.06 (-0.52, -4.1%) with high volume done at 15.7m shares on 11 Apr 2019. Immediate support @ RM11.80, immediate resistance @ RM12.29. "Many of you have been asking what I am personally giving to this company. But with SM Investments coming into the company, this is effectively a takeover and I no longer own much shares. In fact, almost no shares so I will no longer be in the driving seat." Still, she stressed that she plans to stay on for as long as possible to ensure a smooth transition. Best World closed with a black marubozu @ S$1.77 (-0.17, -8.8%) with 9.05m shares done on 12 Apr 2019. Immediate support @ S$1.60, immediate resistance @ S$1.92. S-REITs have a gearing ratio of 45%, as mandated by the Monetary Authority of Singapore. The gearing ratio is calculated by taking a REIT’s total borrowings and dividing it by its total assets. 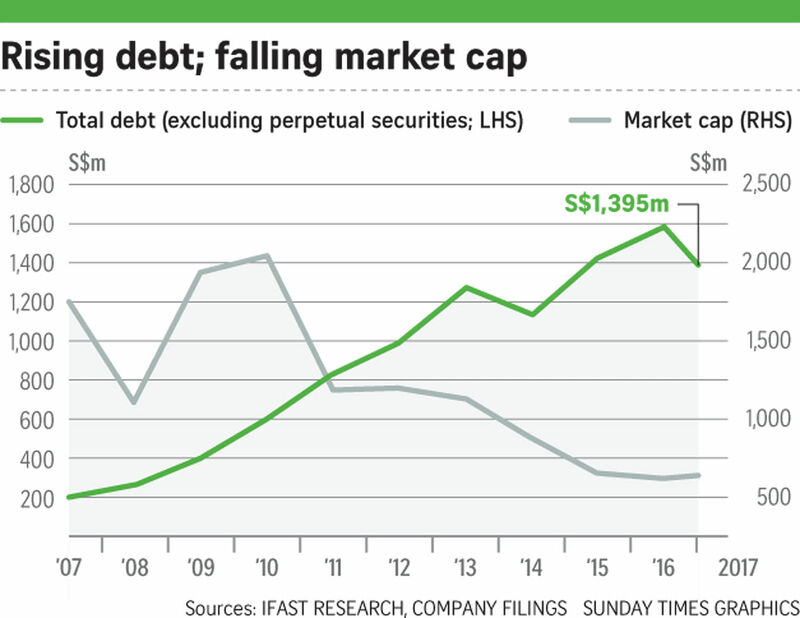 If the 45% cap is hit, the REIT will have to raise funds through a rights issue or private placement to pare down debt and bring its gearing ratio down to a more palatable level. ESR-REIT also has a relatively high net gearing ratio of 41.9%, which increases its risk of a dilutive equity financing. And, when it came to the $150 million claimed by RBC Investor Services Trust Singapore, the trustee of ESR-Reit, for a rent guarantee on Hyflux's Tuas Hub lease, only $83.3 million of that sum made the cut. The two REITs have exposure to three properties where Hyflux operates. Hyflux’s default troubles with the Public Utilities Board (PUB) could spark some short-term pains for Ascendas REIT, which is exposed to Hyflux Building and Hyflux Innovation Centre, and ESR-REIT, which is exposed to 8 Tuas South Lane, CGS-CIMB said in a report. ESR-REIT has already filed proofs of claim against Hyflux on 6 March. 100% of the REIT’s 8 Tuas South Lane property is leased to Hyflux with the water treatment firm currently on the first year of its 15-year lease with ESR-REIT. Hyflux is one of ESR-REIT’s top-10 tenants by rental income and income from the property accounted for 3.5% of rental income in December 2018. 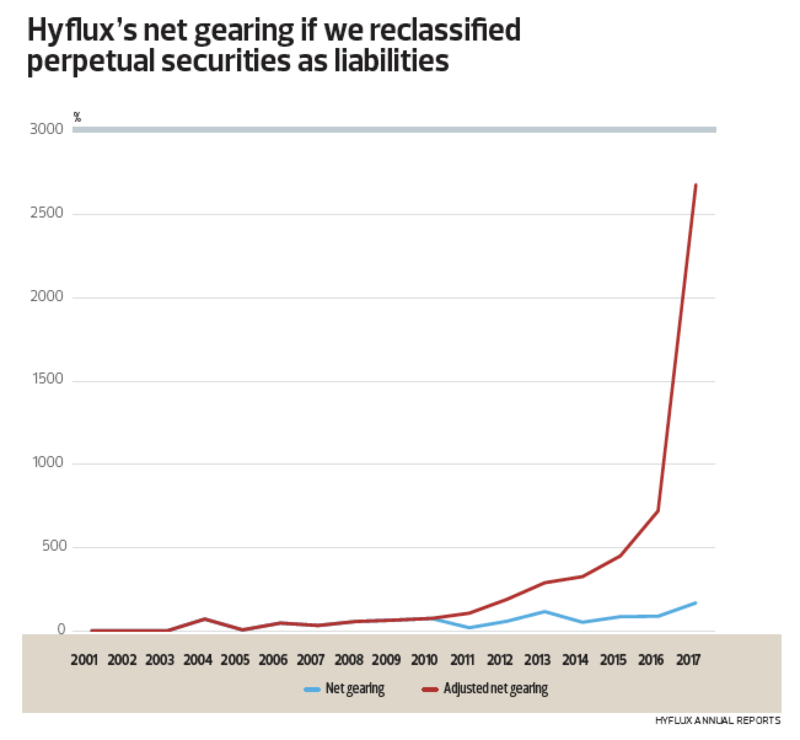 Assuming a worst-case scenario wherein Hyflux is unable to fulfil its rental obligations, the REITs are unable to lease out space in the most recent financial year, and the full amount of the security deposit was drawn down for rental, ESR-REIT would suffer a 5.4% drop in annualised Q4 2018 distribution per unit. Meanwhile, Hyflux’s troubles are expected to have a muted impact on Ascendas REIT. The REIT has Hyflux Building vacant since January 2019. The building contributed $1.9m of rental income as of 2018. Hyflux currently occupies 50% of Hyflux Innovation Centre as its headquarters and has been fulfilling its rent payment obligations to Ascendas REIT. As of 31 December 2018, the property had an occupancy of 88.6%. The asset contributed $17.6m of rental income. Ascendas REIT has a security deposit of $7.6m on both assets. Hyflux accounted for 1.2% of Ascendas REIT’s monthly portfolio gross revenue. “Due to the current non-default of rental payments, we have not factored any impact into our numbers and maintain our forecasts pending greater clarity on the outcome of Hyflux’s restructuring. Key downside risks would be a default on rental and an inability to backfill vacancies, resulting in earnings downside and valuation risk,” Lock concluded. As a rule of thumb; buying stocks at the peak is risky when there is corporate activity. You jumped into buying the shares at high cost before it was halted whereas 苏小妹 has been vested in Viva Ind Tr at much lower cost, long time ago. 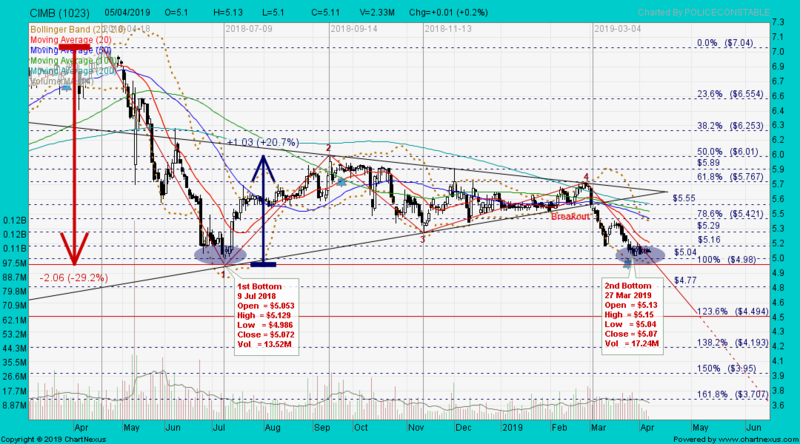 Based on Viva Ind Tr's weekly chart, she bought at cheap and had collected many rounds of dividends. so her risk tolerance is much stronger than you. Viva Ind Tr (weekly) as at 18 May 2018. Indoagri's financial situation（资不底债）is no better than Hyflux. It's a blessing in disguise that The Salim Group has decided to bail-out the SGX-listed company shareholders to save FACE「臭屎密冚」, nothing else. 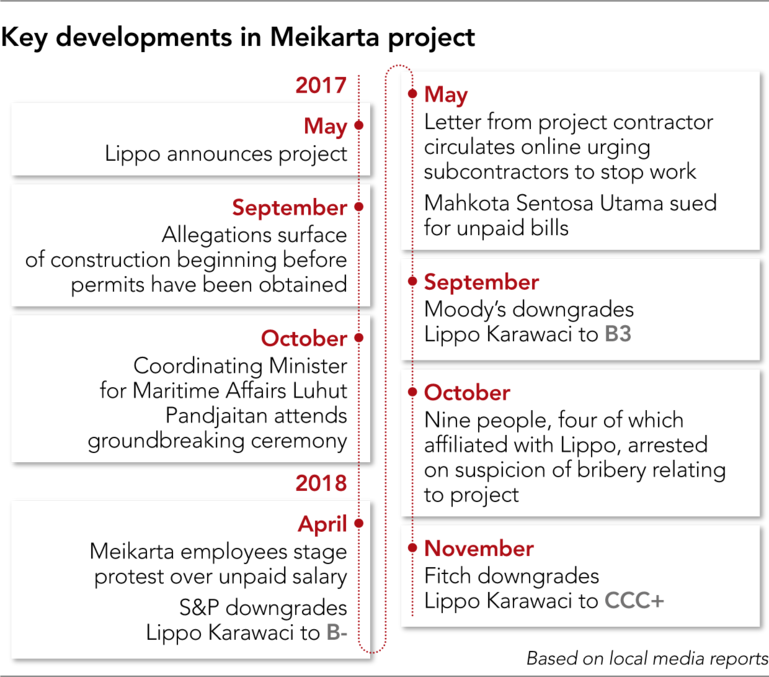 The Salim Group was previously accused of being behind four companies at the forefront of illegal oil palm expansion in Indonesia’s Papua region, employing a complex network of shared directorships and offshore companies to obfuscate its responsibility. 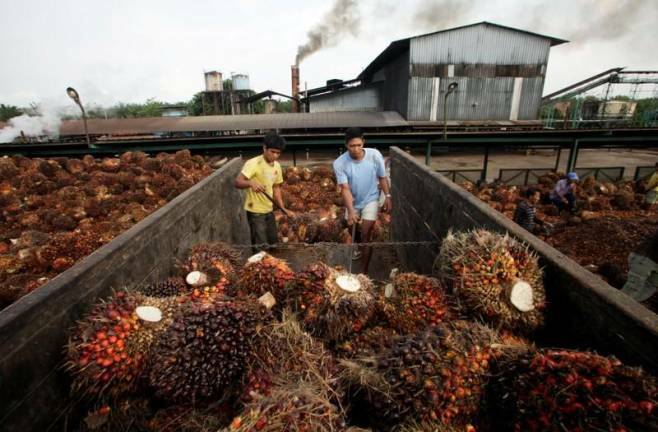 “It is not just the Salim Group; most of the main palm oil groups have these ‘dark sides’ that continue to deforest,” said Selwyn Moran, founder of investigative blog awas MIFEE. Reit Lippo Malls Indonesia Retail Trust (LMIRT) plans to buy Lippo Mall Puri in West Jakarta for US$261.6 million. Lippo Mall Puri is held by a unit of PT Lippo Karawaci Tbk, the sponsor of Lippo Indonesia Retail Trust. It will be the Reit's largest acquisition. Lippo Malls closed with an inverted hammer @ S$0.196 (-0.002, -1%) with 1.93m shares done on 12 Apr 2019. 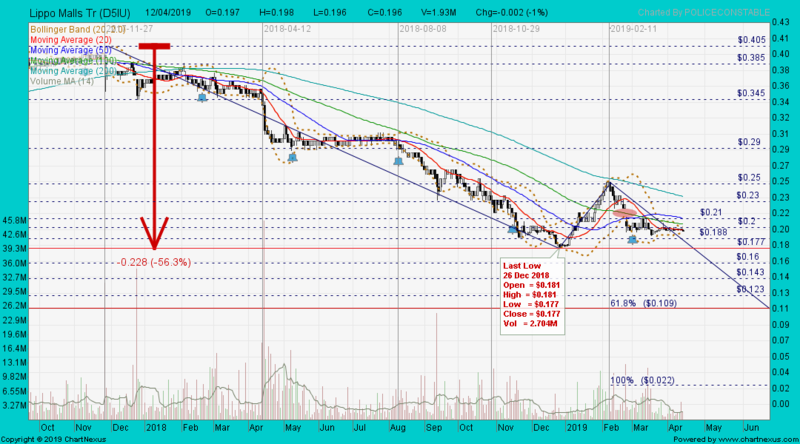 Immediate support @ S$0.188, immediate resistance @ S$0.20. Lippo Malls closed with a gravestone doji @ S$0.24 (-0.005, -2%) with 400,000 shares done on 9 Nov 2018. 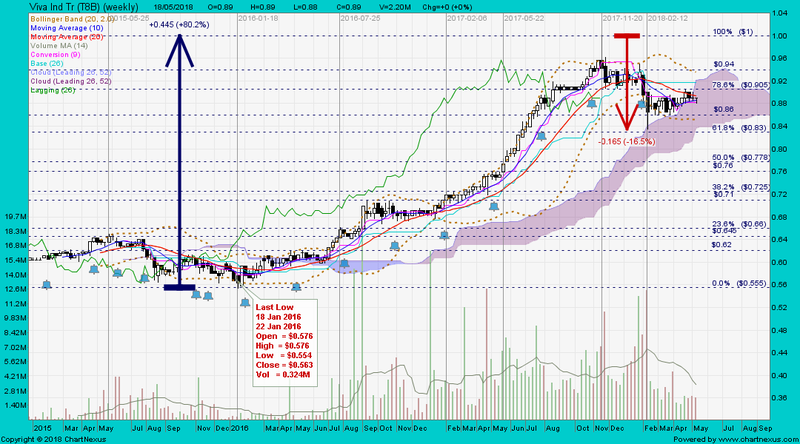 Immediate support @ S$0.225, immediate resistance @ S$0.25. Lippo Malls closed with a black marubozu @ S$0.275 (-0.005, -1.8%) with 5.52m shares done on 31 Aug 2018. 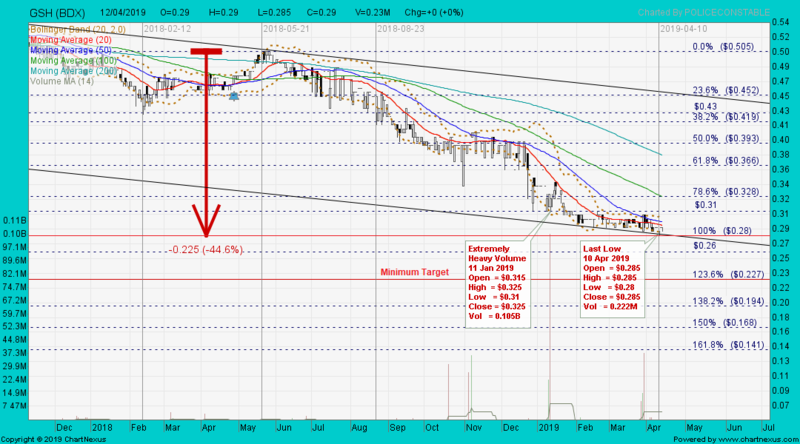 Immediate support @ S$0.26, immediate resistance @ S$0.29. 1. 2019年1月11日 extremely heavy volume done @ 105 million shares. 2. 2018年10月19日 heavy volume done @ 31 million shares. 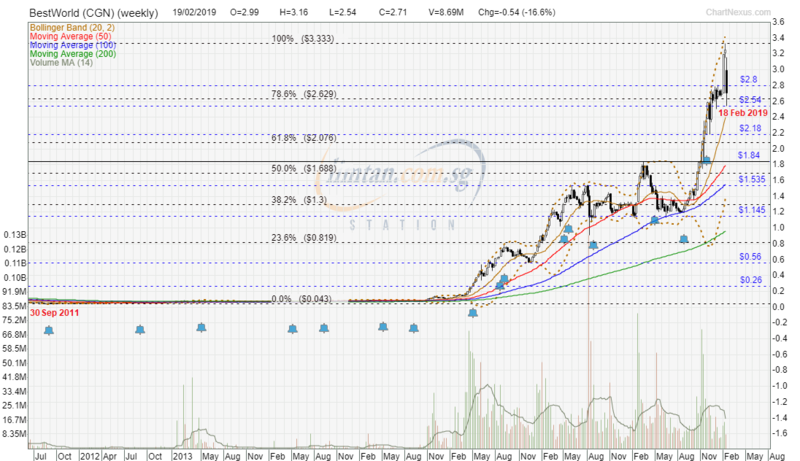 GSH closed with a dragonfly doji unchanged @ S$0.29 with 230,000 shares done on 12 Apr 2019. 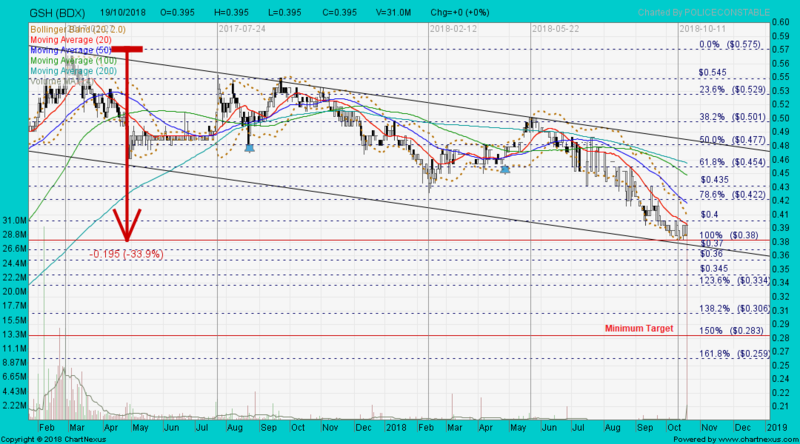 Immediate support @ S$0.28, immediate resistance @ S$0.31. GSH closed with a white marubozu unchanged @ S$0.395 with heavy volume done at 31.0m shares on 19 Oct 2018. 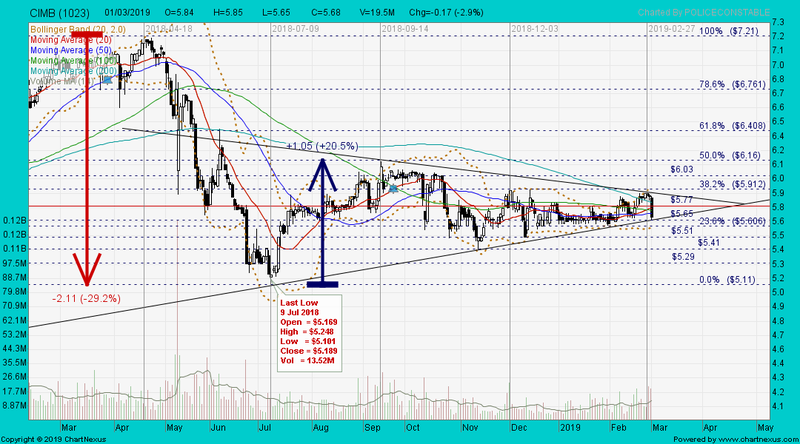 Immediate support @ S$0.38, immediate resistance @ S$0.40. 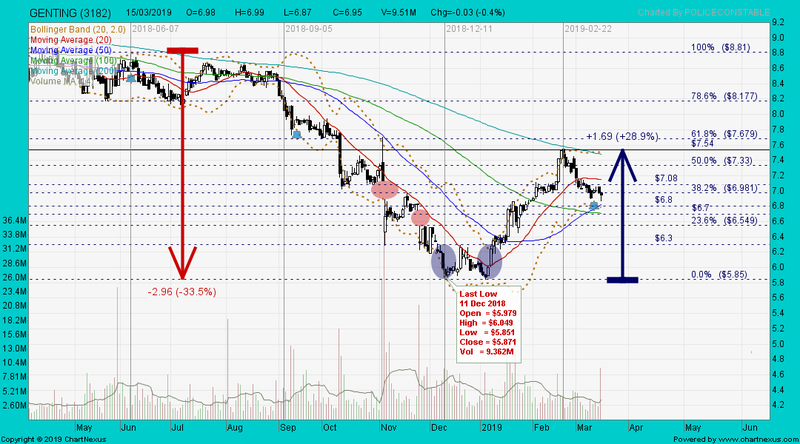 ESR-Reit closed with a "three black crows" @ S$0.52 (-0.005, -1%) with 4.11m shares done on 12 Apr 2019. 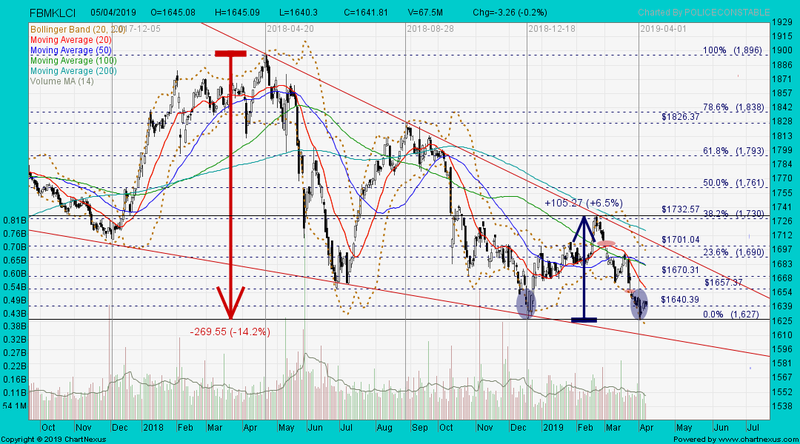 Immediate support @ S$0.515, immediate resistance @ S$0.53. • Some uncertainties to address. • Annualized 1Q19 yield of 8.7%. SINGAPORE (Apr 16): Hongkong-listed CWT International (CWTI) on Tuesday announced it has failed to pay accrued interests and fees to lenders totalling HK$63 million ($10.9 million) which have become due and payable under a HK$1.4 billion facility. As a default has occurred, the lenders have issued demands for immediate payment of the HK$1.4 billion principal and HK$63 million in interests and fees, says CWTI in a filing to the Hongkong Exchange. This security pledged against the HK$1.4 billion facility -- including 100% of CWT, HK$1.2 billion worth of UK properties, US investment properties and golf courses in China -- are also enforceable. If the outstanding amounts are not repaid by 9am tomorrow, the lenders have threatened to obtain possession of all charged assets and will appoint a receiver and manager over them. In addition, the default has triggered a cross default under a HK$766 million term loan facility granted by a lender to an undisclosed wholly owned subsidiary of CWTI. CWTI says that it is actively negotiating with relevant lenders to come up with other repayment arrangements. Nonetheless, CWTI confirms that the group’s total asset is valued more than the above outstanding loans and related amounts. As at Dec 31, 2018, its total assets and net assets came up to HK$24.6 billion and HK$5.3 billion, respectively. 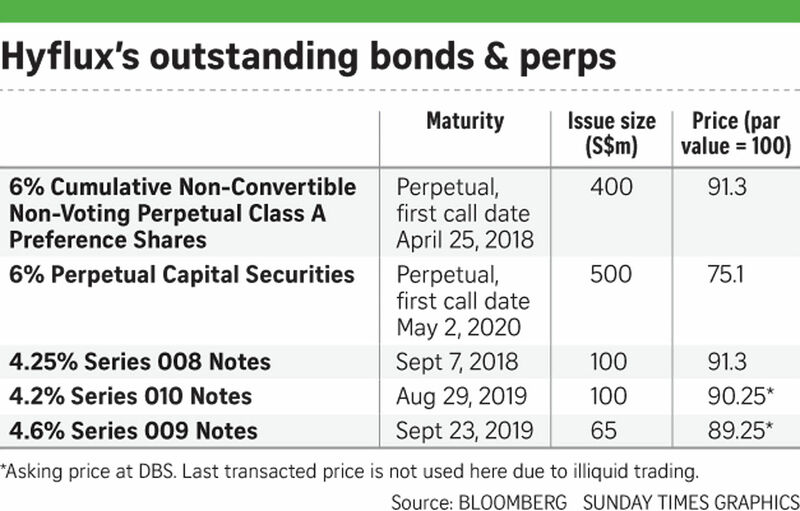 CWTI owns 100% of CWT which has two Singdollar bonds outstanding -- EJ617399 Corp maturing on Apr 18, 2019 and EK799789 Corp maturing on Feb 18, 2020. According to morning note by UOB KayHian, three Singapore REITs also have exposure to CWT. 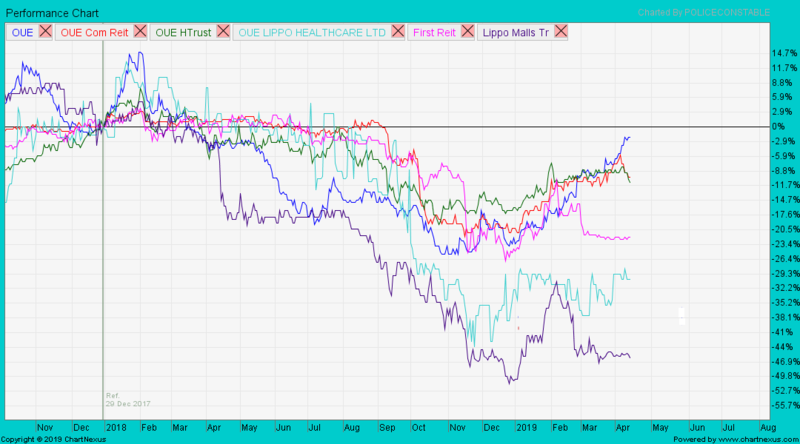 They are AIM APAC REIT (AAREIT) with 8.4% of 3Q19 gross rental income (GRI) or $10 million, Mapletree Logistics Trust (MLT) with 9.1% of FY18 GRI or $36 million, and Cache Logistics Trust (CacheLog Trust) with 20.6% of FY18 GRI of $25 million. UOB says CWT could face potential breach of loan covenants and its operations could also be impacted if CWTI’s lenders enforce security. CWTI could also see a change in control, which in turn may cause the covenants in certain loan facilities of CWT and its subsidiaries to be breached, thus resulting in cross defaults of those loan facilities. "We have highlighted the implications on CWT, AIMS APAC REIT, CacheLog Trust and MLT. Overall, we expect CWTI’s news to potentially result in weakness for CWT’s bonds and some of the REITs bonds/perps mentioned below. We will continue to monitor and provide updates accordingly. Do take note that that CWTSP bonds are not under research coverage," says UOB. In a separate note on MLT, UOB says its REIT manager is well aware that CWTI and the broader HNA Group are in financial distress. As a precaution, MLT has collected security deposits of six months from CWT. About 30% of CWT's properties are leased to third party end-users under sub-lease agreements. “In the event that CWT is wound up, MLT will take over these sub-leases. For the remaining 70% of leases, MLT will refer the end-users -- such as Cold Storage -- to other third party logistics providers, who could take over the leases,” says UOB. CWT became MLT's largest tenant after MLT acquired five modern ramp-up logistics facilities from CWT for $778 million last July. The five modern warehouses are purpose-built with good logistics specifications, such as floor loading of 20-50kN psm and floor-to-ceiling height of 9-14m. They are located in three logistics clusters in the western region and in close proximity to Jurong Port and PSA Terminals. “MLT should not have difficulties re-letting the properties to replacement tenants,” says UOB which has a “hold” on the MLT.